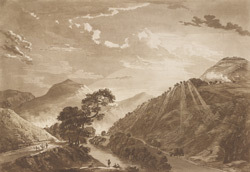 Artist and engraver: Sandby, P.
View of Llangollen in North Wales. To the left of this picture is the turnpike road as it was before improvements made by Thomas Telford in the 1810's. As Surveyor of Public Works for the country of Shropshire he proposed the construction of a road between London and Holyhead to improve communications and trade with Ireland. The road stretched through the Welsh hills and the Snowdonia mountain range. The most difficult part of the work was the building of the Llangollen to Holyhead section because rather than simply improving existing paths it actually involved building a road.